For the second part of my blog entry today, I wanted to introduce you to my ladybugs or ladybirds depending on where you live. I don't know anyone who doesn't love ladybugs. They are just great for many different themed pages, invitations, parties etc. Who says they have to be Fire Engine Red. I have made them in many different colours and sizes.I am even thinking of making them in a patterned paper... too many ideas... so little time. 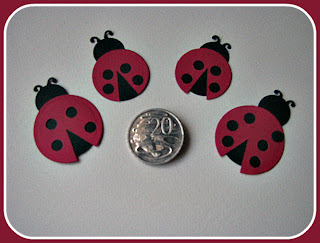 If you are interested in any of these adorable ladybugs then just click on the photo or go to my Zibbet shop to see what else is around.